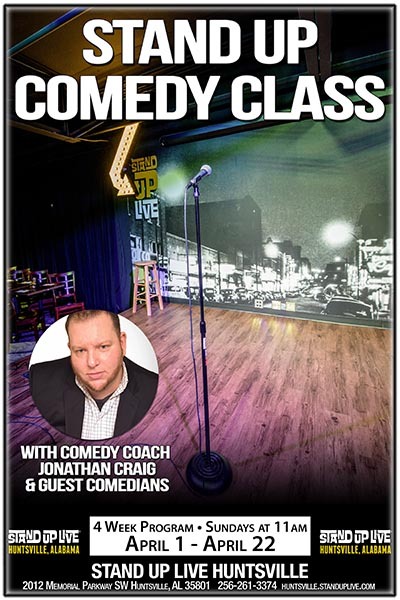 Jonathan Craig will instruct the class based upon the things he has learned from several years of performing stand-up and will give examples of how each student can build a set of jokes that will allow them to be relatable to the audience and feel comfortable on stage in front of a group of people. The goal of this class is to help people use comedy to feel comfortable speaking in front of a group of people and help build a solid foundation for new and beginner comics, by helping them build a strong enough 5 - 10 minute set that they can perform on local showcases and continue to build upon-- giving them a head start on the rest of their comedy peers. Each class will have an established end goal, but ultimately will be interactive and have a natural flow based on student interaction and interest. Each class will be lead by the instructor using teaching aids such as videos, live demonstrations, and open discussion. Starting at week 2 we will have guest comics from the Huntsville comedy scene and Nashville, this will give the students an opportunity to interact with comics who are already active in the scene and allow them to hear a little bit about each comic’s experience and why they pursue comedy. Week 1: Introduction to comedy: Students will be introduced to the instructor, each other, the different types of comedy, and different styles of stand-up comedy. The students will set comedy goals for what they hope to achieve in 6 months, 1-2 years, 5 years, and 10 years. We will watch videos of different Stand-up comedians and learn a little bit from Steve Martin from his Master Class. We will review the assignments for the 1st class and prepare for the next class by giving a new weekly assignment. Week 2: The Stage: In this class we address stage fright and how to overcome it. How to be comfortable on stage. Mic stand placement, where to hold the microphone, and how to connect with the audience. The importance of stage time and how and where to seek opportunities. We will have a Q&A with our guest comic. We will review the assignments from the previous class and prepare for the next class by giving a new weekly assignment. Each student will get to workshop 1 or 2 jokes and receive constructive feedback from their peers and guest comics. Week 3: Keep Writing: In this class we go over the importance of writing every day. Writing exercises that the students can use beyond the class and the importance of having a “comedy buddy” to test material on. Week 4: The business of comedy: Students will learn how to send booking request. How to treat other performers and club staff with respect. Social media tips to promote their self and upcoming shows. How to approach venues for setting up showcases. We will review our comedy goals from week 1 and make any changes. The students will get to meet the management staff of the club and have a Q&A session. We will review the assignments from the previous class. Each student gets to run through their full 5 minute set and receive feedback from their peers and guest comics.